Gibson’s New York Legal Research Guide, Fourth Edition is the latest edition of the most comprehensive legal research guide available for New York State and New York City law. This award-winning guide has again been updated to accommodate the ever-changing laws of New York and contains complete coverage of the rich legal history of the City and its current primary and secondary legal research sources. This guide is essential to studying New York Law and a must-have reference book for any attorney, paralegal, law librarian, law professor, or student performing legal research on New York! The Hein Company is closed today, Tuesday, January 7 due to inclement weather in the Buffalo area. The company will reopen tomorrow Wednesday, January 8. The Hein Company will be closing today, December 24 at 12:30 PM EST. We will also be closed Wednesday, December 25. The company will reopen Thursday, December 26. 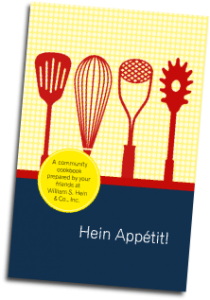 Hein Appétit – Now Available to Download! 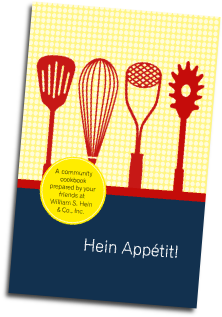 We are very excited to announce that we released our first ever community Cookbook this year at AALL! Recipes were submitted by customers and employees and feature appetizers, beverages, breads/rolls, desserts, main dishes, side dishes, soups/salads, and more! View the Cookbook online to get cookin’! The Hein Company will be closed Monday, December 31 and Tuesday, January 1. The company will reopen Wednesday, January 2. We hope you have a great holiday and great weekend, talk to you in the new year! Today marks the fourth day of Customer Appreciation Week! Contact marketing@wshein.com or 800-828-7571 and reference promotion code: APPDay4 to receive this special promotion! Act Fast! Promotion end date is 11/16/2012. Click here to learn more about customer appreciation week! Three Weeks & Counting Until AALL 2012! Have You Heard of Hein’s Current Content Subscription Model? Hein’s New Current Online Subscription Model provides you access to articles as soon as they are published! What is Hein’s Current Online Subscription Model? Hein is pleased to introduce the Current Online Subscription Model! This model allows journals to publish their content on the HeinOnline platform. This will allow users to gain online access to every article as soon as it is published. Online access also includes all historical volumes, making the entire archive fully searchable in an online format. PLUS, users will be provided access to exclusive material not found in the bound volumes such as classic books, bibliographies of works, and links to other material of interest all related to the international jurisprudence of the family. Completely Reformatted 2nd Edition Now Available! Completely revised and updated with extended coverage! Now including more than 5,000 entries! Now contains more than 1,600 public laws and extended coverage of early congresses! Sources of Compiled Legislative Histories: A Bibliography of Government Documents, Periodical Articles, and Books, 1st Congress -110th Congress is intended as a locator of previously compiled legislative histories. All compilations are for major laws and refer to sources ranging from congressional documents to legal periodicals, and from treatises to looseleaf services. What is the Patent Reform Act? The Leahy-Smith America Invents Act (also known as the Patent Reform Act of 2011) makes the most significant changes to U.S. patent law since 1952. Among the changes made by the Act, the most significant and controversial is the switch in patent priority from “first to invent” to “first to file.” This change grants a patent to the first person to file a patent application, regardless of the date of the invention. More than 6,000 pages of bills, reports, and hearings!